No one in her right mind buys parsley plants. They are simply too easy to start from seed, right? Well, maybe not on a strip of land in north Texas, midst the USDA-designated “Grand Prairie,” where the soil is so alkaline as to resemble gray chalk. So I paid the price. It’s still cheaper than buying the cut parsley for $2.50 per recipe. Like all my herbs, this one went into a clay pot full of beautiful store-bought loam. I watered and fertilized and Ms. Parsley promptly rewarded me with new, dark green leaves. All sailed smoothly for a couple of weeks. Suddenly, the weather went all hot and dry, as spring in Texas is wont to do. 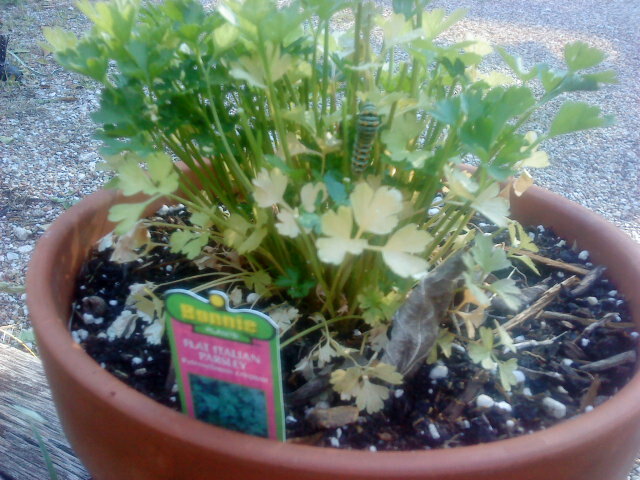 I watered all the herbs but the parsley seemed particularly unhappy about it and began to turn yellow around the edges. Investigating, I found two very large caterpillars making lunch of my investment. I knew their names immediately–Papilio polyxenes asterius (Stoll)–these were larvae with whom I had previously done business. The spiky green worms with black bands and yellow dots are the larvae stage of the black swallowtail butterfly. The last time I planted parsley, the voracious consumers got the best of me and had completely defoliated the plants before I found them. I popped the chrysalises into a jar so I could see what emerged before deciding they were worthy of life. How beautiful! Photos simply don’t capture the way sunlight makes the blue scales sparkle. I released the hatching butterflies, of course, and was glad I hadn’t squashed them out of existence in my irritation at losing my herbs. This year the two worms are caught in the act and I have a decision to make. Do I want parsley or beauty? Life is full of hard choices. Sometimes there isn’t a good way to go. What do you think? Do I go buy another parsley plant before the garden center sells out? Or do I squash? Who lives–green plant or blue and black flutter-by varmint? 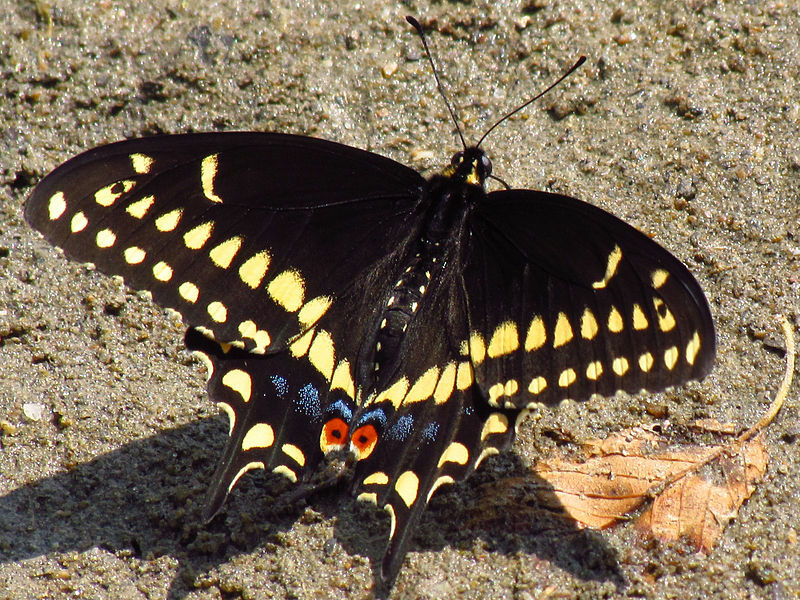 This entry was posted in Short Takes on Life and tagged black swallowtail butterfly, caterpillar, chrysalis, herb garden, papilio polyxenes asterius, parsley. Bookmark the permalink. My vote goes to that beautiful butterfly. It occurs to me that if an ugly creature had emerged, I’d be voting for the parsley! Some insight into human nature here, perhaps? Thanks for reading & participating, Mamasava. What a great article, and an awesome inspiration to watch the emerging butterfly! I did have a moment of sympathy for the parsley, though – it had never occurred to me how tough it must be to grow herbs in Texas, lol – so I’m glad if you were able to save it the second time around! Thanks! Not all of Texas, just the particular strip of land I landed in. Glad something made lunch of my pests…so I didn’t have to. 😀 Happy you stopped by, fellow writer.